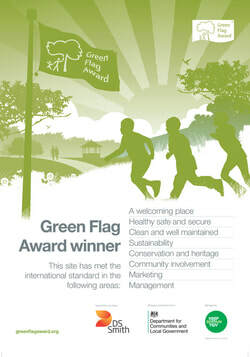 WFoR is flying the flag again as one of the UK's very best green spaces! The Windlesham Field of Remembrance in Windlesham, Surrey has been recognised by the Green Flag Award Scheme as one of the very best in the world for 2017/2018! The field is among a record breaking 1,797 UK parks and green spaces that has received a Green Flag Community Award - the mark of a quality park or green space. This international award, now into its third decade, is a sign to the public that the space boasts the highest possible environmental standards and is beautifully maintained. The Windlesham Field of Remembrance was established in 1950 when it was purchased by public donations. The woodland was purchased in 1987 and the site now totals 18 acres in size. The Field is still owned by the village and is managed by a dedicated committee of volunteer trustees. Chair of Trustees Suzanne Sharman said: "We are absolutely delighted to receive a Green Flag award for the second year running. "We know how much quality green spaces matter to residents and visitors, and this award celebrates the dedication that goes in to maintaining Windlesham FoR to such a high standard. The award means a great deal to the Windlesham Community who continue to be responsible for the funding, management and maintenance of The Field. International Green Flag Award scheme manager Paul Todd said: We are delighted to be celebrating another record-breaking year for the Green Flag Award Scheme.